BANK workers may soon enjoy higher wages through the progressive wage model (PWM) as the National Trades Union Congress extends the model to other sectors of the economy. Max Lim, president of Singapore Bank Employees' Union (SBEU), said on Friday that the union is trying to have a dialogue with banks to implement the PWM in the banking industry. "The National Trades Union Congress is spearheading the PWM through our various union clusters to achieve its May Day theme of Better Workers, Better Jobs, Better Lives. The PWM has a clear wage, skill and career progression ladder," he said at the SBEU's 60th anniversary dinner. The SBEU has 6,000 members including general branch members and 33 banks under its fold. The government has supported the move to incorporate PWM for the cleaning sector and a similar approach would be extended to the security and landscape sectors. The PWM is part of a broad push to raise the income of low-wage workers. Mr Lim cited NTUC secretary-general Lim Swee Say as saying recently that the PWM is for all levels and for all sectors. "The NTUC financial cluster in which SBEU is a partner is trying to have dialogues with the banks to implement PWM for our level in the banking industry. As such, on this occasion, I would like to invite the banks to come forward and have a dialogue with us." The banks are employing mostly polytechnic and university graduates, he noted. This means that the vast majority of the new employees are officers, managers, executives or professionals. They are beyond the scope of representation and collective bargaining of the SBEU Constitution. 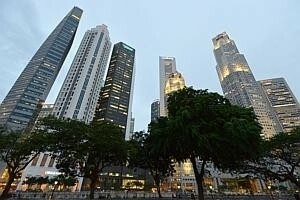 Furthermore, the banks are also employing more contract, part-time and temporary workers, said Mr Lim. Standard Chartered Bank said that it was fully supportive of the PWM. Peter Hatt, its regional head, human resources, Asean, said that the model sets out to raise wages for people in the banking sector through productivity, training and job redesign initiatives.